Rumor has it that Ewing's suits are made from Under Armor material. 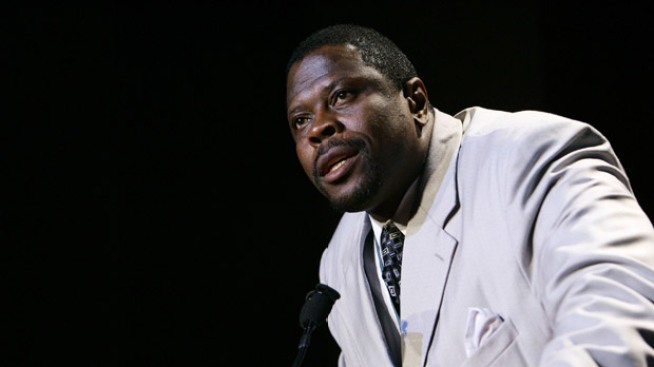 Patrick Ewing as coach of the Wizards? The idea isn't getting much love from Wizards Nation faithful, just check the comments on Wiz blog, Bullets Forever. Since leaving Georgetown with an NCAA championship ring in '85, the sweaty Jamaican was frozen, enveloped to the Knicks, won numerous NBA accolades, came up short on attempts to bring a championship to the Big Apple, and infamously displayed his wares at the now defunct Gold Club in Atlanta. Ewing's coaching credentials include a stint as a Wizards assistant in '03-'04, and time spent mentoring Yao Ming in Houston from '04-'06. Since June '07, he's helped coach the game's best young big man, Dwight Howard, in Orlando. Recently, Ewing has been profiling for an NBA head coaching gig, even though he won't publicly comment on jobs not yet officially available. The Orlando Sentinel's Brian Schmitz reports, "If the Washington Wizards are in the market for a head coach, people close to Magic assistant Patrick Ewing say the Hall of Famer would be receptive.......While Ewing would prefer a team with some better building blocks than the wretched Wizards, he wants to land one of the coveted jobs after serving six seasons as an NBA assistant." With all due respect to Ewing, the comments from people "close to him" would indicate that the former Hoya is driving down a one-way street. In other words, the Wizards should be receptive to him applying for the job, and not the other way around. The beggar can't also be a chooser. Ewing's NBA HOF career and meager six years as an assistant does not make a robust resumé, and is hardly comparable to the time spent toiling amongst the CBA coaching ranks by the likes of Phil Jackson and Flip Saunders. Maybe Ewing will be a good coach one day, maybe he won't. But a guy whose coaching experience seems rather limited to just big man development is not ideal for a Wizards team hopeful to turn the corner posthaste. Kyle Weidie also writes Truth About It and contributes to Bullets Forever, both Washington Wizards blogs. He's woken up in a cold sweat thinking about Patrick Ewing's sweat.